Recently I received a call about an American Robin‘s nest that fell down twice from a gutter. The frustrated homeowner put the babies in what was left of the nest, placed the nest on a table on her deck and called me, asking what to do. As we were talking she saw an adult robin with a mouthful of worms feed the babies in the new location. We worked out a plan on how to make the nest safe and secure on the gutter. I told her to call me back if it did not work out. Well, she did call back, happy and excited! The nest was firmly in place and the baby robins were being fed by the parents. Success! 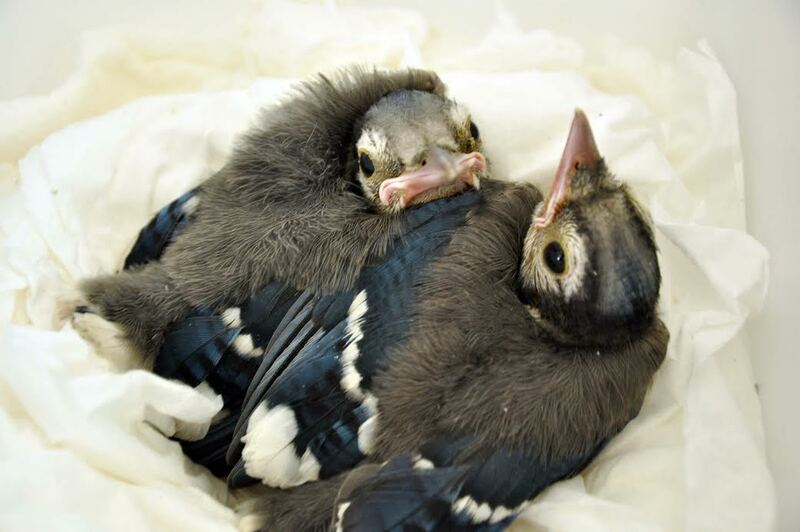 Wild bird rehabilitators want bird parents to feed their own babies. After all, “Mother knows best.” We also try to re-nest uninjured baby birds so we don’t interfere with a bird’s breeding cycle. Experience shows that bird parents do feed babies in makeshift nests reattached to tree branches, bushes, gutters, and even tree cavity sections duct taped to another tree. A parent bird’s instinct to feed and protect their young is very strong, and they will not willingly abandon their babies. Unfortunately a bird’s nest location is not always perfect. Predators and storms can wreak havoc and human intervention is sometimes needed for survival. 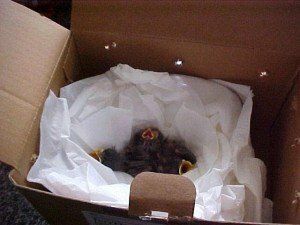 Putting a baby bird back in its nest is not always the right thing to do. So: When do you intervene? Here are some examples of when a bird definitely needs your help and a call to a federally permitted bird rehabilitator is warranted. 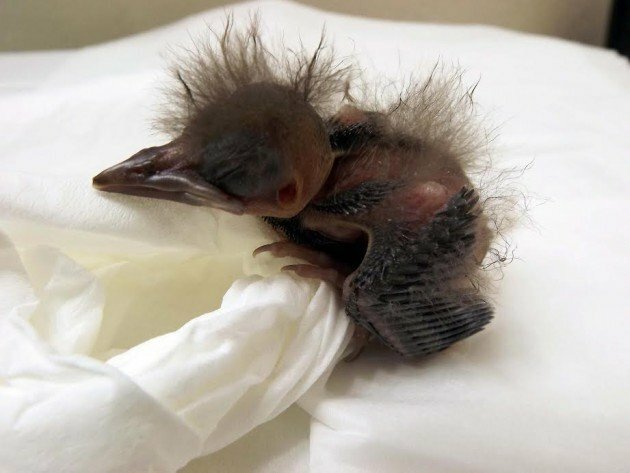 *Baby bird found on ground with NO or very little feathering – can’t find nest. *Baby bird found on ground, something is wrong, seems injured. *Baby birds feel cold in nest/bird box; heads don’t pop up, parent birds absent. *Baby bird with lots of mites. Mites will eventually kill the bird. *Child brings home a baby bird. Gone from nest for several hours. *Nestling or fledgeling bird with one or both parents confirmed dead. *A hummingbird found on the ground. *Emergency! Bird brought in by a cat or dog. Call and transport the bird to a bird rehabber ASAP. It needs to be properly medicated and triaged. The shorter the time between the scratch or bite and the bird getting treatment, the greater the bird’s chance of survival. Even if you do not see an obvious wound, cat or dog saliva, which is full of nasty bacteria, can still get into a bird’s eyes/orifices and will eventually kill the bird; it will just die more slowly and painfully. Ok, so you’ve rescued a bird. Yes, you will need to call someone for assistance, but first calm your bird and yourself. Find a box. Punch a few air holes in the sides. Make a cloth or tissue “nest” in the box. Then place the bird in the “nest” and close the box. Make the call. Featherless baby birds need to be kept warm, so add a warm (microwaved) rice sock or Hot Hands pack near but not touching the bird. And yes, it is tempting to want to feed that helpless begging little bird, but resist! Bird diets are specific to each species; liquids and food fed improperly can cause a bird to aspirate, get sick or die. It is illegal to keep a wild bird. So please understand, the proper care and correct diet for a wild bird is not found on the Internet no matter what the website states. Do not fret; you will be transferring the bird to a qualified person so they can feed it correctly with the appropriate diet. 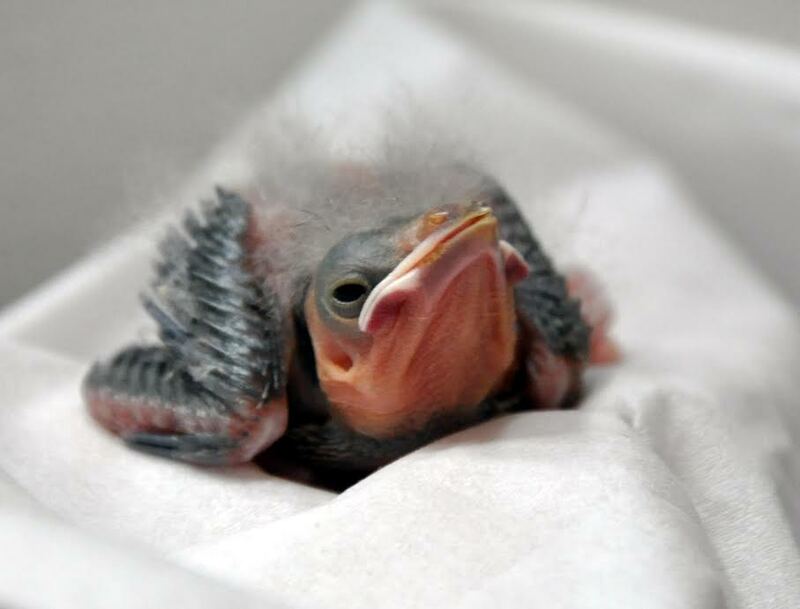 If you have the desire to rescue and feed baby birds, become a volunteer with a federally permitted bird rehabber; we can always use the help! Maureen Eiger has been a state and federally licensed wild bird rehabber for over 8 years and is based in Roanoke, VA. She is currently the VP of the Roanoke Valley Bird Club; whenever she is not rehabbing, she can be found birding. Which, she adds, is not very often. You rehabbers are heroes! Thank you for the very important information. This week’s NYTimes Magazine (8/16/15) features a wonderful story (To the Rescue) about bird rehabilitation, a perfect follow-up to Suzie’s Spotlight on Maureen. Bless you all !